Showcasing Esperance’s premium barley, with a colour and foam resembling the enticing perilous shorelines of Sandy Hook Island. 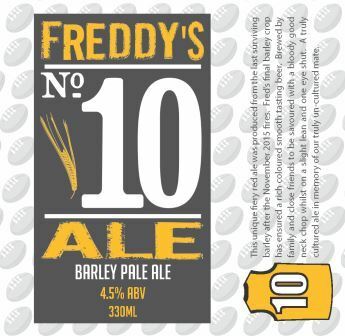 This barley pale ale is all about refreshment and drinkability. Saaz and Cascade hops bring a light bitterness, citrus fruit & spiciness to what is a well balanced and approachable beer. 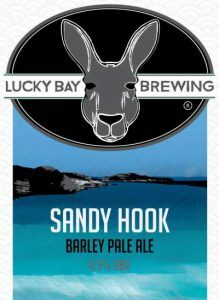 Pairing Note: Sandy Hook is a great accompaniment to a wide variety of meals including snapper and chips. 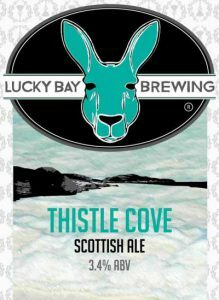 A Scottish style ale that is balanced firmly towards the malt flavours. 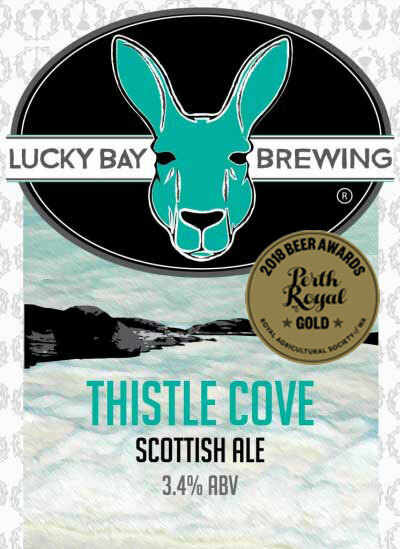 Malt sweetness adds mouth-filling character, while the roasted malts add complexity and bitterness to ensure this mid-strength beer delivers on flavour just like the views at Thistle Cove. Pairing Note: This thirst quencher is a great accompaniment to a wide variety of meals including bbq meats, roasts and vegies. 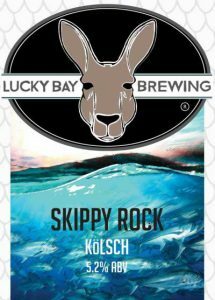 Skippy Rock – German Kölsch This straw-coloured German pale ale is delicate and refreshing. Fermented warm, served cold and drunk young and fresh. It displays subtle apple and pear fruitiness, a malt sweetness and a dry but spicy finish to reward you like only your favourite Skippy Rock can. Pairing Note: The Kölsch is a great accompaniment to a wide variety of meals including chicken and salad. NEW RELEASE: A thirst quencher for dusty harvest days when dreaming of island fishing with your mates. 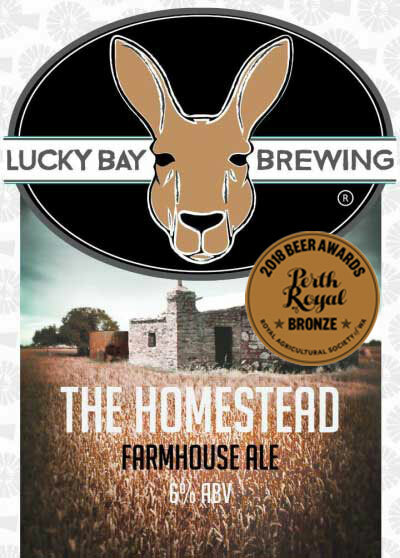 Brewed with the best of Esperance barley and specialty Aussie malts with light fruity tones from late hopping. 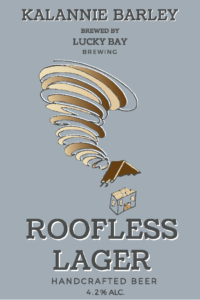 A beer for every wind just like its island namesake. 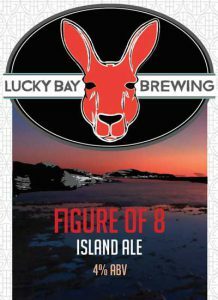 Pairing Note: Figure of 8 is great paired with a wide variety of meals including burgers, nachos and pizza. 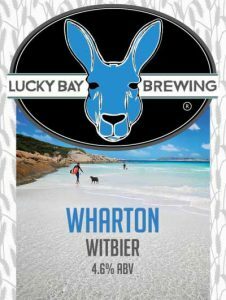 Wharton – Witbier A refreshing crisp fruity seasonal ale featuring local wheat direct from the paddock to the brewery to you. Belgium Witbier ‘white beer’ is light golden, hazy, with subtle citrus spice balancing the silky smooth malt. Spritzy carbonation and perfect white froth will quench your thirst and entice you to wet your palette like the white sands and spectacular blue waters. This crisp refreshing Belgian Saison ‘farmhouse’ style ale has the rustic strong character of our historical Homesteads. Traditionally these ales were brewed in farmhouses during winter ready for drinking come summer. Pale, unfiltered with expressive citrus spicy flavours and a dry finish. Pairing Note: The Farmhouse Ale is great paired with full flavoured dishes from spicy asian to curries, grilled meats, shellfish, and garlic herb butter. This one-eyed epic force of nature is easily one of the heaviest waves in the world. 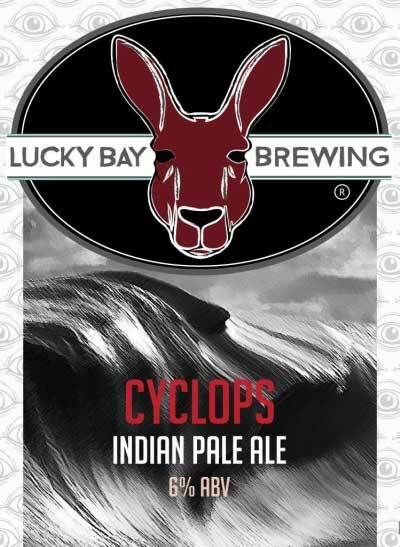 Cyclops India Pale Ale reflects the legend wave with enormous, explosive power holding up a strong wall of flavour, ramped up hops and a dry bitter finish. Pairing Note: Cyclops is a match for anything from pizzas to burgers to antipasto. This Dark Ale salutes the great Tanker Jetty. In appreciation of an iconic Esperance landmark with a rich shared history experiencing dark times. 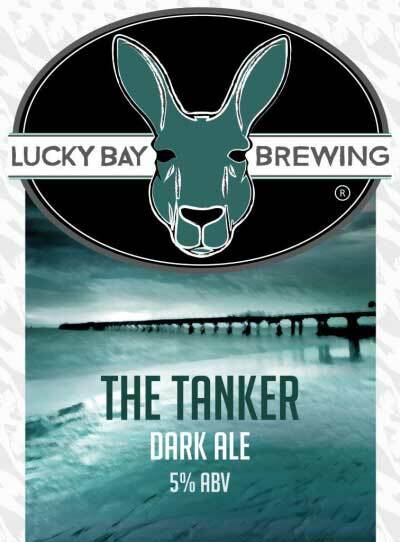 The Tanker balances a complex but subtle array of malt flavours (caramel, toast, nuts, liquorice, chocolate and coffee) with a mildly spicy finish. Pairing Note: Pairing Note: The Tanker tastes great with with BBQ’s, grilled cheese, roasts and stews. This Porter will remind you of happy times sitting around a campfire watching your billy boil, and your eyes watering from the smoke! Very dark smokey porter. Strong flavour of roasted coffee, chocolate, toffee. Pairing Note: The Porter shines when paired with oysters, vintage Chedder cheese, brownies, cheese cake and waffles. 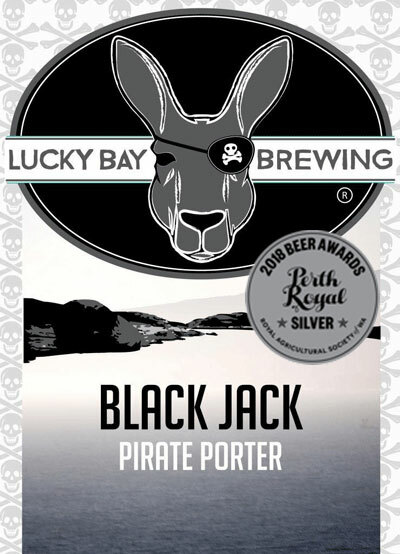 Named after Black Jack Anderson, Australia’s only pirate who roamed the waters near Middle Island wreaking havoc to locals and passers by. This nearly black dark porter beer contains strong flavours of roasted grains, toffee, coffee and chocolate with a mild hint of smoked beech. 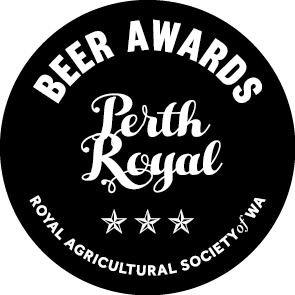 Lucky Bay Brewing won big at the 2018 Perth Royal Beer Awards, taking home a GOLD, SILVER and BRONZE for three of our brews. This was the first time we had entered the competition and we are very excited to win these prestigious awards! This unique fiery red ale was produced from the last surviving barley after the November 2015 fires. Fred’s final barley crop has ensured a rich coloured smooth tasting beer. Brewed by family and close friends to be savoured with a bloody good neck chop whilst on a slight lean and one eye shut. A truly cultured ale in memory of our truly un-cultured mate. 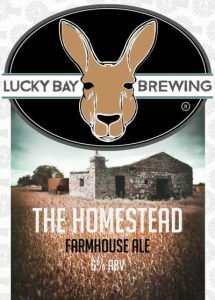 Brewed by Lucky Bay Brewing on behalf of the Curnow family and friends, 2016. The Railway Hotel in Meckering was destroyed by an earthquake in 1968. To ensure locals could still enjoy a beer, the Shell roadhouse was set up as a temporary pub selling beer that was reportedly “all shook up”. 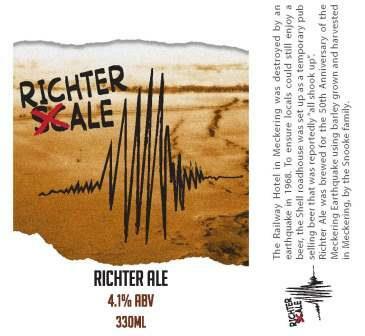 Richter Ale was brewed for the 50th Anniversary of the Meckering Earthquake using barley grown and harvested in Meckering, by the Snooke family. 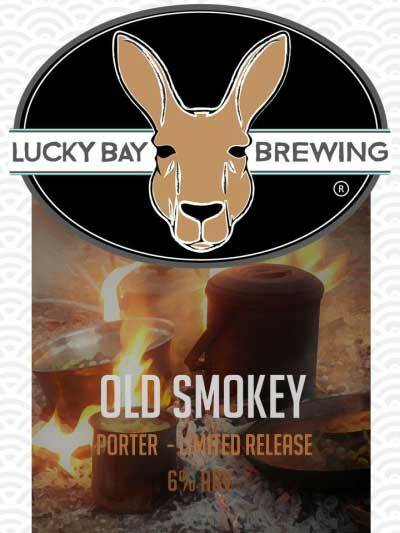 Brewed by Lucky Bay Brewing on behalf of the Meckering community, 2018. Special brew made with Kalannie barley for ‘Wheatstock Kalannie 2019’. Celebrating a new roof on the Kalannie Sporting & Recreation Club after a crazy tornado ripped it off in 2018.